Good chain link fence installers are hard to come by. Our chain link fence installers are some of the best in New York. A Chain link fence offers the same advantages as your typical PVC or Wood Picket or Solid fences but at a lesser cost. Chain link fences come GALVANIZED and in a variety of different galvanized vinyl coated wires: BLACK (the most popular), GREEN, BROWN, and WHITE. When choosing a vinyl coated wire chain link fence you are choosing galvanized wire with a vinyl coating on top that helps your fence become more weather resilient. Chain link fences are maintenance free, so there will never be a need for you to treat or stain this type of fence. At All Island Fence & Railing we use ONLY galvanized wire, posts, fittings, rails and caps in order to provide you with a material that is the ultimate option against corrosion. Our chain link fences are built and installed to last you years and years. 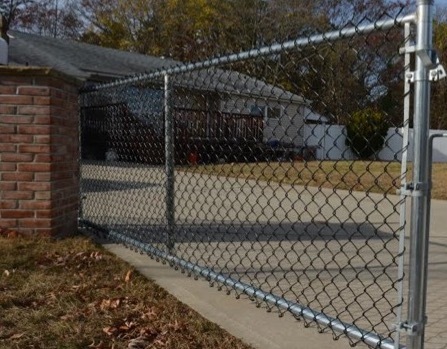 Throughout Nassau, and Suffolk county, NY we come across plenty of homeowners who want a budget friendly fence and also want the most privacy available, so time and time again we recommend a chain link fence with the addition of Winged Slats. Winged slats give you the full privacy a solid fence would, at a budget friendly cost. The wire is offered in different gauges that vary from thinnest to thickest depending on your use for the fence, and the diameter of the wire mesh is also available in different sizes. This product can be used in residential or commercial properties.